In keeping up with Physician Compare and Hospital Compare, CMS has launched the Hospice Compare website for those looking to evaluate end-of-life care options. I’m fortunate to live in a community with some very well-regarded hospice organizations, but I recognize that there are people out there who prey upon families during a highly vulnerable time. In addition to showing quality metrics for pain management and treatment of other symptoms such as shortness of breath, it also displays whether a hospice is for-profit or not and when they were certified. I had the privilege of being in the path of totality for this week’s total eclipse. Although I wasn’t able to get any photos on my own (this one is courtesy of NASA) it truly was spectacular. I’ve seen a partial eclipse before (back in 1979 with a trusty cereal box pinhole viewer) but I have to say, seeing it through filtering glasses was a very different experience. I did make a pinhole projector and showed it off to a couple of kids who needed a dose of low-tech magic. Even with some pre-eclipse reading, I saw things I didn’t expect to look the way they actually did, such as the crescent shadows through the trees and the shadow bands right before totality. The coolest pinhole projector I saw was a colander, which projected dozens of mini-eclipses on the ground. 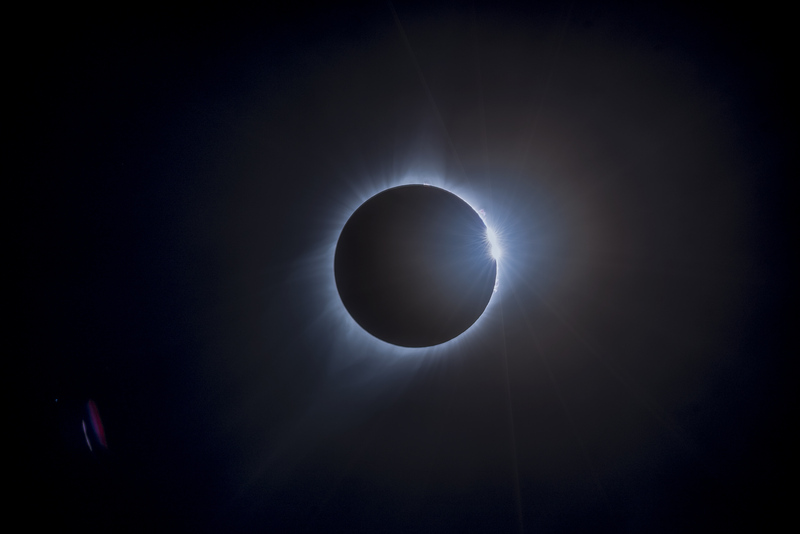 I do completely understand how people damage their eyes, because as the eclipse progressed past the totality phase, I wanted to keep looking at the corona. The brightness made that idea a short-lived one and I went back to my viewing glasses after taking another good look at the shadow bands on the ground as they appeared again on the eclipse’s way out. 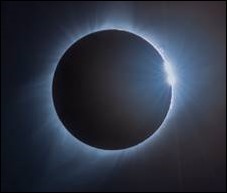 I’m not ready to become an eclipse chaser, but if you have the opportunity to see a total eclipse, I definitely wouldn’t miss it. An ophthalmologist friend from residency practices in the eclipse pathway and had several patients call his office Monday evening and Tuesday morning wondering about retinal injury. Fortunately, he didn’t see any significant damage. Tuesday, it was back to the grind, working with a client in the advertising space. I’ve worked with advertising and PR firms before, usually in the context of helping a healthcare organization rebuild their brand, but a couple of times with product launches. This is the first time that the marketing firm has been my client. They engaged me because their efforts to build a healthcare business line have stalled. It seemed like an interesting challenge and they were referred to me by a solid client who convinced them that they needed some tough love from someone in the healthcare trenches. Initially I thought that they just didn’t understand the healthcare business, but as I began to shadow them on calls with their clients, I realized that the root cause may be that they don’t understand marketing. My past experiences with marketing and advertising firms have followed a fairly predictable course. They begin to understand the client’s business and the client’s goals, then take a survey of the current state. Was the client working with another agency? Were they trying to do their own marketing? What kinds of media were used? What was successful? What flopped? As part of understanding the client’s business, they interviewed stakeholders to understand how the business saw itself, then used that information to build a marketing plan for the organization. My advertising client is working with a practice that is trying to launch an ambulatory surgery center (ASC), but the project has been one barrier after another and they’re challenged by some occupancy and rezoning issues. Regardless, they want to move forward with a plan to get their name and brand more visible in the community so they can bring providers on board and then launch the services to the community. I thought it should be pretty straightforward, and had no idea what I was about to hear on the call. My client didn’t go into any of the background about why the practice wants to move into the ASC space and what they hope to achieve. They also didn’t ask what the organization is doing for marketing and what has been successful in the past. They launched straight into a checklist of “what date do you want to start running ads in the newspaper” type items that were completely ineffective. It was clear that the practice was frustrated since they’re not marketers and that’s why they hired someone to assist. It was clear that the marketing firm had done no research on the client’s current web and social media presence. When the client balked at the checklist approach, my client effectively scolded their own client for their lack of understanding of the process. They then proceeded to go through a patronizing explanation of the marketing process that was so full of jargon that it was making my head hurt. The practice had no idea what to make of statements like, “You need to give us information that will prime the pump” and “we need you to give us content that will hit the sweet spot.” I was in continuous contact with my client via instant messenger and tried to steer the conversation to keep the practice from hanging up on them, hoping that they could take a step back and get the client talking about why this expansion was important to them. One of the marketing team actually asked, “What does ambulatory mean?” and I think I laughed out loud. If the practice wasn’t confident about their choice before, I’m sure this sealed the deal. (Pro tip: Google is your friend. Do some prep work.) I struggled through the rest of the hour making plenty of notes for my post-meeting discussion with the marketers. Although they were going to get an earful, I wish I could have given some coaching to the practice as well. First off, I wondered if they even checked references on this marketing firm or whether they went with the cheapest offer, or how they came to work with my client. My client currently has zero referenceable clients, which is why they hired me, and although it’s possible they could have fabricated something, I doubt it. One of the reasons I went into consulting was to help small to mid-sized practices that were struggling with technology and working with vendors and who wanted outside advice on the best ways to move forward. I’m rarely surprised by lack of business savvy among healthcare providers because it’s not something they typically learn during their training. But I continue to be amazed by the cluelessness of the many vendors that are trying to find the pot of gold at the end of the healthcare rainbow. How does your organization handle marketing? Email me.